I absolutely love the name of the Trapper T-Rex, which it lives up to with it’s size and power. If you must go for a kill over a non-kill trap, speed and efficiency are paramount in ensuring that the animal does not suffer at all and has a quick death. I wish that I never had to kill a living thing in my home, I really do. The thing is that I have a young family to protect from disease and other nasty things that an infestation can bring with it. 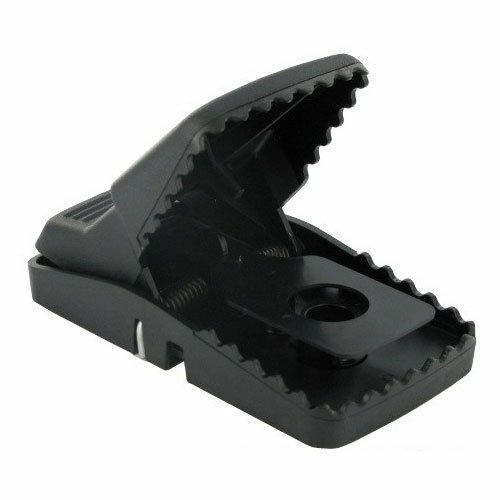 This thing is larger and slightly more expensive than some of the other plastic snap traps that I have reviewed. It is actually meant for rats, weasels, and other larger sized rodents, but I have still found that it is sensitive enough to catch even small mice. The choices ultimately yours on whether or not you use a killer or no kill trap. I always like to assess the situation and I try to use a humane catch and release over a snap trap when possible. I do realize that there are some situations where it is not practical or possible to set up a live cage, in which case this is one of the best rat sized kill traps I have found. Make sure to set up parallel to a wall, back to operate against it. If you do not do this properly you have the chance of the critter grabbing the be from the side where the back and running. You want to make sure that the rat or mouse has to walk the full length of the trap to ensure that the proper trigger and clean kill. Pardon the term, but the trapper T Rex is virtually idiot proof when it comes to set up and operation. It’s as simple as placing the bait as far back as you can. You simply have to open the device all the way, and it sets itself automatically. There is no lever or other mechanism to fiddle with. This is great because there is no chance of snapping her fingers like it with the older fashioned Victor wooden snaps. While this thing is powerful and large enough to be used on larger sized rats, it is far from perfect once you start getting up in size. The powerful jaws will nearly always instantly dispatch a small sized rodents, but once you start getting up there with the larger breeds there is a chance that the rat will not be fully dead when you find it. I won’t spell it out for you here, but usually you’ll have to find a way to finish the job on your own in these cases. Many people prefer drowning, but this sounds horrific to me. Fortunately I’ve never been in the situation as I’ve never dealt with the especially large kind of rodents that this would apply to. If you absolutely do not want to find yourself in the situation than I would suggest a good quality lives trap such as the atomic Barbie instead.